After a leisurely breakfast move out to visit Jama Masjid, Chandni Chowk and Red Fort. Further move out for a sightseeing tour of the city that includes visiting to the Humanyuns Tomb, Qutab Minar, Birla Temple and Sikh Temple along with other attractions for short time like President House, India Gate etc. In the Evening, You are free to move around the colorful markets for shopping or move out for a walking tour of the old streets of the Delhi. Overnight in Hotel. After a leisurely breakfast, Drive to Neemrana and visit Fort Palace now turned into the one of the oldest heritage hotel of India built in 1464 AD in rock cut Aravali hills and local sightseeing of Neemrana visiting 11 storey deep step well and local traditional village. Evening explore the Fort Palace- stepped palaces of this architectural jewel cut into the hillside to sprawl over 3 acres/1.2 hectares and rises to 10 levels commanding the most splendid views. Including a vista a pool to the horizon. From 1986, the ruins of this Fort-Palace have been sensitively restored and reconstructed. Day is kept to explore the fort and rural life in near by village. Overnight at hotel. Drive to Mandawa. On arrival check in your hotel, later in the day explore the town and surrounding area of The semidesert region of Shekhawati. The open air art gallery, as it is popularly called is famous for its plethora of painted havelis, all commendable pieces of the rich artistic traditional of this region. In the morning drive towards Rohet via Jodhpur and visit Meharangarh fort, Jaswant Thada and Clock Tower. On arrival check in your hotel. Rest of the time at leisure. Rohet is a 375 year old Rajput style fort set in rural countryside on the banks of a lake in Rohet village, yet just half an hour's drive from Jodhpur. It is a true desert oasis with its flower filled gardens, a swimming pool and beautiful rooms with lake views. Rohet is a perfect destination for horse riding and discovering local villages and the local wildlife. Overnight at Hotel. 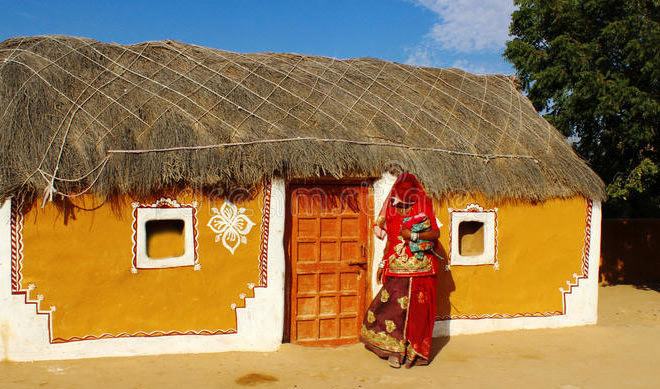 Explore near by Bishnoi villages and have lunch. From there drive for Jaipur. After that welcome to charming Pink City, In the evening, take a walking tour of the colorful streets and bazaars of Jaipur City. The beauty of Jaipur is that its unique architecture and town planning is visible at even the most common places such as its squares and lanes. Overnight at Hotel. Afternoon City sightseeing tour of Jaipur, Jaipur offers a plethora of touristy attractions to the traveler. The City Palace in the heart of Jaipur is known for its blend of Rajasthani and Mughal architecture. Not far away is the Central Museum with its large collection of woodwork, jewellery, costumes, brassware, and pottery. Another monument near the City Palace, Jantar Mantar, is the largest of the five observatories built by Sawai Jai Singh. The Hawa Mahal or the Palace of Winds was constructed for the royal ladies to watch the royal processions without being seen. Overnight at Hotel. On the way to Agra visit Fathepur Sikri the ghost city 195 kms from Jaipur, Fatehpur Sikri is built in red sandstone in honour of Saint Salim Chisti who foretold the birth of 3 sons to Emperor Akbar, is an example of robust stability combined with originality. Each important edifice here represents a type by itself. Notable among them is the Diwan e Khas, Punch Mahal, the Tomb of Salim Chisti, and the Buland Darwaza. After visit continue to drive to Agra, on arrival transfer to hotel. After lunch you visit to witness incomparable Taj Mahal with its' speculative view. Taj Mahal, the architectural modern day wonder of the world; this monument is a fine example of the fusion of many architectural styles is one of the wonders of the modern world. Taj, endowed it with some of the loveliest buildings in the world. The tour continues with a visit to the Agra Fort from where one can get the most moving view of the Taj from the little octagonal tower in the Agra Fort which lies across the river Jamuna, followed by visit to Pearl Mosque and the Tomb of Itamad-ud-Daula built by Empress Noorjehan in memory of her father. In the evening you may visit to the souvenirs market of Agra, one should visit Oswal Emporium where they have built a Mini Taj Mahal inside their showroom and it took 10 years for the artists to complete the mini replica of the Taj. The show room conducts free sound & light show showing the eras of Taj Mahal. Overnight at Hotel. Delhi, 200km and 4hrs of traveling, after having breakfast at hotels you can take few hours in Agra for visit and then continue driving to Delhi en route visit the Sikandra, mausoleum of Emperor Akbar built in 1492, The Tomb is combination of Muslims and Hindu Architectural styles. On your arrival in Delhi you will drop at International Airport for your onward flight destination.